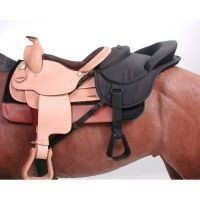 This saddle addition is constructed of tough cordura nylon over shock absorbing foam with rigid thick foam padded cantle . The ride-behind tandem attaches firmly to the back of most western saddles. Complete with stirrups and adjustable nylon leathers. Nylon straps on these will provide handles. Brown. Saddle not included.